What do you even know about Bolivia? I know this: Butch Cassidy and the Sundance Kid may or may not have died there. Ernesto Che Guevara was murdered there October 9, 1969 in La Higuera, Bolivia when he executed by a firing squad that was sponsored by the American Government. Here is a quickie wiki about Bolivia which is a very interesting place and very multicultural. Bolivia has gained global attention for its ‘Law of the Rights of Mother Earth‘, which accords nature the same rights as humans. “The law defines Mother Earth as “…the dynamic living system formed by the indivisible community of all life systems and living beings whom are interrelated, interdependent, and complementary, which share a common destiny; adding that “Mother Earth is considered sacred in the worldview of Indigenous peoples and nations. In this approach human beings and their communities are considered a part of mother earth, by being integrated in “Life systems” defined as “…complex and dynamic communities of plants, animals, micro-organisms and other beings in their environment, in which human communities and the rest of nature interact as a functional unit, under the influence of climatic, physiographic and geologic factors, as well as the productive practices and cultural diversity of Bolivians of both genders, and the world views of Indigenous nations and peoples, intercultural communities and the Afro-Bolivians. This definition can be seen as a more inclusive definition of ecosystems because it explicitly includes the social, cultural and economic dimensions of human communities. I love this! We will see below that corporations think they are people. But in Bolivia Mother Nature has rights! Bectel.. Bectel… Where do I know that name from? On April 17, Bechtel received one of the first and largest of the rebuilding contracts in Iraq. Worth $680 million over 18 months, the contract includes the rebuilding, repair and/or assessment of virtually every significant element of Iraq’s infrastructure, from power generation facilities to electrical grids to the municipal water and sewage systems. The contract was granted in backroom deals without open and transparent bidding processes and the content remains hidden behind a veil of secrecy. The contract has not been publicly disclosed to American taxpayers, who will be paying the majority of the bill. While there is no doubt that Bechtel has experience in these areas, it is an experience from which the people of Iraq should be spared. Bechtel’s “Mini” Masquerade“Though Bechtel is the world’s largest telecommunications, engineering and construction firm (with $32.9 billion in revenue and 52,700 employees), in terms of corporate structure it is one of America’s largest “small businesses.” That’s because the giant corporation takes advantage of a 1958 law intended to extend limited liability protection to owners of small, family-owned businesses. Companies that qualify for this law’s “S Corporation” status do not have to pay federal corporate income taxes. Instead the company’s profits are reported as personal income by individual owners. While the Bechtel empire was hardly the intended beneficiary, their firm technically qualifies for the S Corporation status because it is family run and has less than 100 shareholders. At the time the law was enacted, the wide differential between top corporate tax rates (52 percent) and top individual rates (91 percent) was a disincentive for gaming the system to dodge taxes. Fast forward half a century and top tax rates have collapsed to only 35 percent for corporations and individuals, erasing the previous disincentive for big corporations to change their business status. By incorporating as an S Corporation, enormous businesses like Bechtel pay just individual taxes, rather than having their corporation pay taxes on corporate profits and shareholders pay taxes on their dividends. S Corporations, and other businesses where income is taxed only at the individual level, have become the new tax haven, where large businesses have fled to avoid US corporate income taxes. In 2008, more than 14,000 S Corporation tax returns were filed by firms with more than $50 million in revenue, according to the IRS. These 14,000 firms, with an average profit of $6.4 million each, collectively reported 29 percent of the total profit on nearly 4 million S Corporation tax returns. Preserving S Corporation status for real small businesses can help level the playing field, but closing the loophole that allows giant multinational corporations to avoid the corporate taxes that their peers have to pay is key to bringing more fairness to the tax code and more funds into public coffers. Cochabamba or Quchapampa is a city in central Bolivia, located in a valley bearing the same name in the Andes mountain range. It is the capital of the Cochabamba Department and is the fourth largest city in Bolivia with approximate population of 1.938.401. Many Cochabambans objected to the rates that Bechtel imposed on its customer. Their water bills tripled and quadrupled. Half their monthly income went to water. To fuel the fire, Bechtel was granted control to seize homes of delinquent customer when ownership arrangements were defined. 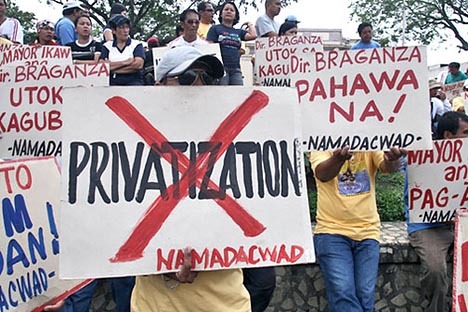 Large groups of enraged Cochabamban residents took to the streets and began the protest against Bechtel. Agricultural runoff is one of the main contributors to water pollution in Bolivia, together with domestic municipal wastewater and dumping by industries and mines. The greatest percentage of the pollution load is due to diffuse dumping from agricultural and fishing activities and runoffs of urban areas. There are no regulations or controls over major dumping from non-specific sources, despite its volume and toxicity. In 2001, Bechtel filed suit against the Bolivian government, citing damages of more for $25 million. Bechtel argues that its contract was only to administer the water system, which suffered from terrible internal corruption and poor service, and that the local government raised water prices. The continuing legal battle attracted attention from anti-globalization and anti-capitalist groups. This topic is explored in the 2003 documentary film The Corporation and on Bechtel’s website. In January 2006, Bechtel and the other international partners settled the lawsuit against the Bolivian government for a reported $0.30 (thirty cents) after intense protests and a ruling on jurisdiction favorable to Bechtel by the International Centre for the Settlement of Investment Disputes. So what’s going in Bolivia right now. Then we have ingenuity and SCIENCE! “Researchers from the University of Oklahoma have discovered a technique to remove pollutants from water that requires minimal labor costs and is powered by nature itself. After 15 years of testing, research has shown this passive water treatment method to be successful in as diverse geography as the flatlands of Oklahoma and the mountains of Bolivia. The passive water treatment system is created by engineering an ecosystem consisting of a series of filtering ponds. As the water moves through each specifically designed pond, a natural chemical or biological process removes certain contaminants as it slowly moves from one cell into the other before being re-released into natural waterways. “When the water reaches the last pond, it has gone from looking like orange, sediment-laden sludge to clear water,” said Robert Nairn, associate director for OU’s Water Technologies for Emerging Regions Center and director of the Center for Restoration of Ecosystems and Watersheds. Here is the full movie The Corporation. Please watch and make a donation to these incredible filmmakers. So all kinds of fun stuff today. Mother Earth has rights, we have a cool doc to watch and we learned all about Bolivia! To my Bolivian Readers: I loved learning about Bolivia today and I hope there is more you can share with me! Aqua para todos mi amigos! 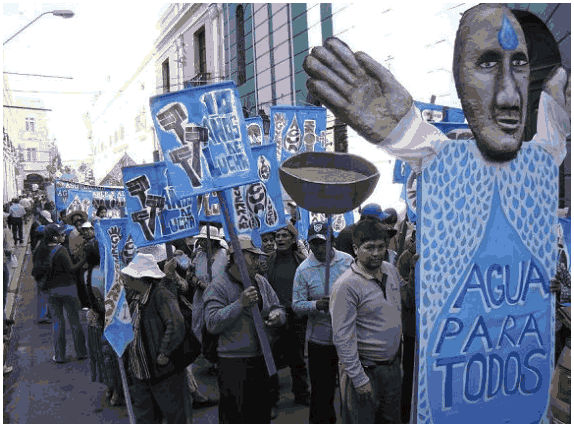 El agua es vida!